The first annual (?) RemoDemo was held at Debbie’s place yesterday. 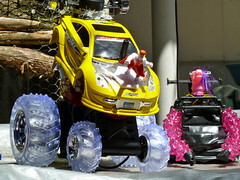 Six contestants (Debbie, Kath, Jacs, Tim (withdrew), Olyvia, and I) had identical remote controlled cars, $30, and about 3 months to modify them to compete in a demolition derby. The idea behind having identical cars was that it would be the modifications that would make the difference in whose car was left driving at the end … however, we figured out a couple of days before the competition that the cars were all using the same frequency for the control, so driving one car meant driving them all. We had a go to see what this would be like, and it was as chaotic as you might imagine – the contest was quickly reconfigured to be a simple race (and next year we’ll ensure that we all are using different frequencies!). My car (left) was the slowest to complete. I completely took apart the original car, and grafted the pieces on to another vehicle. I had various weapons systems (a set of tires to deploy that would hopefully hinder the other cars, which had much smaller wheels, the ability to tilt up and smash down on other cars (with a drill and catching loop underneath), a lot of extra weight (for ramming), a rear slicer, and a top lance), and defensive systems (discardable top shell, ability to right itself if tipped, individual wheel control, two power sources, two controllers). However, my car did not fare well in the initial chaos of multiple controllers – the signal for the other cars to drive forward was the signal for mine to drive in circles as fast as possible – so it tipped and crashed a lot under other people’s control – by the time of the race, there wasn’t very much left of it other than the second car. In the race it moved fast enough, but was a bit tricky to steer (not enough practice with the independent wheel system) and tipped five or six times (I managed to right it every time without touching the car, which would have been great in a fight, but was way too slow in a race). Kath’s car (right, next to mine) was the next slowest. She had a horse head with glowing eyes, a black paint job, and strange tentacle things, although it was mostly the original car underneath. For some reason during the race her car developed a tendency to steer left, and so crashed and needed manual help quite a bit – still faster than me, though! Olyvia’s car (“Mr Whippy”) ended up in the middle of the pack. She went for form over function, although the spiky roof might have caused trouble for cars that tried to crush from above (like mine would have – although perhaps my loop would have caught and tipped her). The defensive shell might also have helped, especially against ramming, although once tipped it would have been all over. By the time of the race the shell made it a bit tricky to turn, and so the loop at the end of the race proved her undoing, with an unasked assist from Samuel and then one herself as well. Jacs left modding her car until the morning of the event, so in the end Darren just gave it a (very nice) paint job – it was otherwise unchanged. This meant that it was possibly the fastest and most maneuverable of the cars – it would have been interesting to see how well it performed in a fight (no real weapons, but perhaps it could stay out of everyone else’s way). Darren drove, and came extremely close to winning (there was a little interference from Samuel in the middle, which may have been the deciding factor). Debbie’s car was also quite weaponised (as well as looking very sleek). There was a ramp-like piece at the front, which I suspect would have tipped most of the cars (probably not mine with all the extra weight) if she managed to hit them right, and a large fork at the back (perhaps for ramming in reverse, it might have also tipped others), and a roman candle strapped (not tightly enough!) to the roof, which, if it had managed to hit another car, would have done a lot of damage (it had to be manually lit). The car had an oddly fish-like driving style, but managed to complete the race without much trouble at all, and just fast enough to beat Darren/Jacs. She didn’t light the candle during the race, but did afterwards. Sam wasn’t an official competitor, but very eagerly took part in everything he could. He got two RC cars for Christmas, and raced the Lamborghini alongside everyone else when they were racing (ironically, his two cars and also his RC helicopter were all different frequencies to the rest of us). For a four-year-old, he’s not a bad driver, and if he had tried properly, might have done a reasonable time (probably better than mine!). 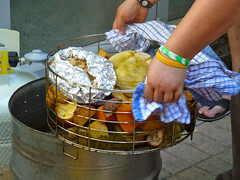 Debbie made a “keg hangi” for dinner (Jacs made chocolate tarts for dessert), which will be hard to top at next year’s event (we might cycle round venues, so maybe Jac’s and Darren’s place next year). 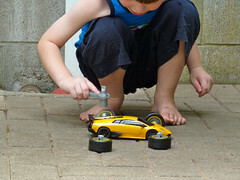 Posted in Uncategorized.Tagged cars, racing, remodemo, remote controlled cars.